If you’re hungry in Notre-Dame-de-Grâce this summer, you’ve got options. Residents can stop at community gardens across the neighbourhood to pick freshly grown vegetables and herbs — for free. Community workers and volunteers are coming together this week to kick off another season of Incredible Edibles, an urban gardening initiative which began five years ago. Kathy Aitken, who’s part of the Incredible Edibles team, said residents love the idea. On Sunday, Incredible Edibles is holding a planting session for volunteers and community workers, along with a workshop on how to design a garden, held by Jane Barr, the coordinator of Incredible Edibles in NDG. It’s being held at 1 p.m. in front of the post office at Sherbrooke Street and Wilson Avenue, where one of the gardens is located. The plants come from local farms, including the organic producer Jardins Carya, as well as from community organizers who grew plants in their homes under lights. Other urban agriculture initiatives, like Le Mange-Trottoir, aim to foster community, too. The group is starting its planting session at a community garden at Castelnau and Drolet streets today starting at 10 a.m. The City of Montreal also organizes and maintains community gardens in almost every borough. Plant beds were set up on Somerled Avenue on Saturday in two locations — in front of the Metro grocery store at the corner of Prince of Wales Avenue, and in front of Fire Station 46 at Cumberland Avenue. A circular herb garden was built in front of the fire station. Two more gardens, at Monkland and Montclair Avenues in front of a home and in front of Coop la Maison Verte, are also part of the neighbourhood’s collection of urban gardens. About 40 people came to help out on Somerled Street, Saturday, Aitken said. One of them was Lianne Luciani, who said she believes gardening brings people together. After four years of planting vegetables and herbs in sidewalk gardens on Sherbrooke St. W. and Monkland Ave., the people behind the Incredible Edibles project hope to get closer to that dream this summer by expanding their gardens throughout the neighbourhood. The five sidewalk gardens on the bustling N.D.G. arteries allow residents to harvest peas, basil, calendula, arugula and chives whenever they want. The food is free, planted and tended by volunteers. More donations are rolling in for the program, hosted by Transition N.D.G. 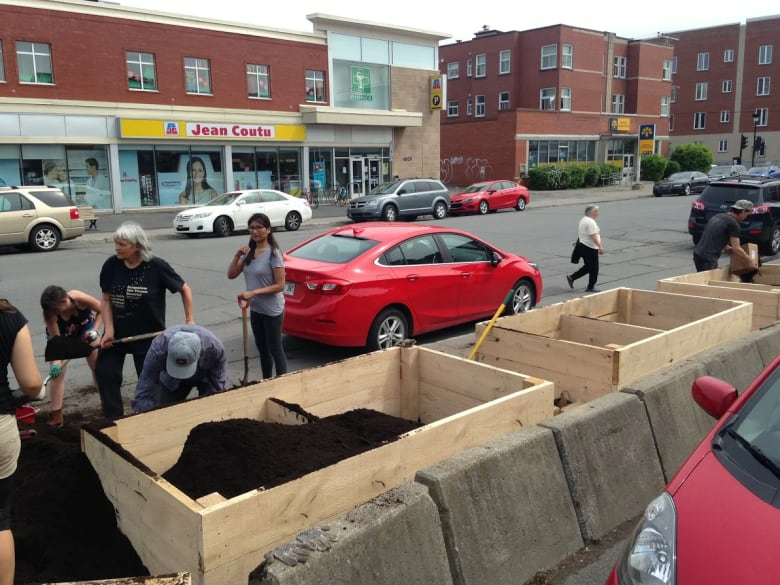 Organizers intend to add planters on Somerled Ave. and expand to streets like Terrebonne St. and Wilson Ave.
Ikeda was one of about a dozen volunteers tilling the soil, sowing seeds and planting seedlings in the three large, wooden planters paid for by funds raised by Transition N.D.G. The planters were placed there last season after the organization got permission from both the federal government and the city. Ikeda is a founding board member of the five-year-old organization that, according to its website, works to support the “emerging community economy, based on sharing and cooperation.” As part of the global “transition movement,” the organization hosts regular workshops, film screenings, talks and events in an ongoing effort to educate the public — encouraging self-reliance and resilience in the community. Incredible Edibles, which got its start in a small English town in 2008, has since cropped up in communities around the world as volunteers work to reclaim public space to grow food. Passersby are encouraged to pluck some herbs or pull a few carrots, leaving some for the next person who comes along. The N.D.G. project was started in 2013 with handmade planters built out of recycled materials. The sidewalk planters have flourished with kale, radishes, sunflowers, tomatillos, borage and more as volunteers work to keep the gardens watered and weeded. While support for the project has been growing, it has met some resistance: In 2015, a disgruntled resident destroyed the gardens in front of his condo building at Draper Ave. and Sherbrooke. Attempts to negotiate with the man were fruitless, so volunteers moved on to other locations o Sherbrooke, including the Carrefour Jeunesse Emploi N.D.G., the post office and the Coop la Maison Verte. And it beautifies the neighbourhood, said project coordinator Jane Barr, who also serves as the organization’s vice-president. Herbs have become a popular component of the gardens, she said, as volunteers grow sage, parsley, thyme and mint. It’s something residents enjoy, she said, because instead of buying oversized bundles at the supermarket, they can just harvest a bit from a sidewalk garden. There are signs on the plants indicating what’s growing, and how to use certain plants like the medicinal herbs. Lilly Christensen had caught wind of the volunteer planting session on Facebook and, living around the corner, she jumped on board. New to N.D.G., Christensen said she loves to cook and she looks forward to using a few of the street-grown ingredients later in the season. This article was published in the Montreal Gazette on June 3rd, 2017. To see it in its original context, click here. Hopkins, Rob, The Power of Just Doing Stuff. Eisenstein, Charles, The More Beautiful World Our Hearts Know Is Possible.